A well organized and passionate group of San Carlos residents are doing everything possible to communicate their desire to keep our parks open. Last month, the San Carlos Parks and Recreation Department announced that they would be recommending the closure of Crestview Park, Arguello Park, Laureola Park and the Youth Center, as part of their mandatory budget cutbacks. Their recommendations are scheduled to be discussed by the San Carlos City Council. 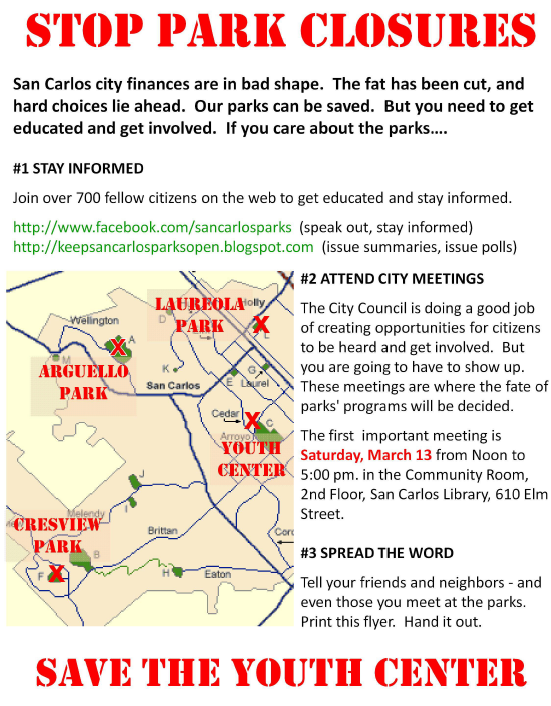 A group going by the name “Keep San Carlos Parks Open” has their own blog dedicated to the effort to save our parks from closure. A link to that site can be found by clicking here. Additionally, you can join their Facebook group by clicking here. As of the Friday morning, the group has already assembled 723 members. Finally, the group has a specific “call to action” that can be found in the PDF below as well as on their blog and Facebook group page. Please consider joining this worthwhile cause. Thanks so much for posting this! I am so grateful to hear that there is a citizen’s group organized around these two important issues. Both the parks and the Youth Center need to be available for our community. They provide invaluable services. I will definitely get involved. I think the greatest challenge we face is how to spend wisely the few dollars that we have on these services. We may have to face the option of having the Youth Center rely more on a fee based model. It is not ideal–but we need to be open to considering all options. I think the City Council members are working hard to find some real options that may help the city to save services through an alternative funding model. It will not be easy. I am so glad that this group is getting organized to work on this very important issue.